This is my first Quick Dump Valve cannon. It was built to test the failure of ABS DWV non pressure rated pipe as it is often used in combustion cannons. I had built a few PVC air cannons prior to this unit and due to the brittleness of PVC and several failures, I built this to see if ABS could work as a replacement for PVC. The cannon is now 7 years old and my oldest functional air cannon. In assembly, the barrel had rectangular ports cut into the side next to where the rear reducer is located. and then assembled into the chamber barrel assembly with a fill valve stuck in the side to create a weak point of failure. In assembling the barrel end, the end became stuck and I didn't get it pushed all the way together. Now I have two possible points of failure to watch. It is now more dangerous than I originally planned. As always, it is not a good idea to use non pressure rated pipe for air cannons. Test your materials safely. To seal the barrel a valve core was needed. Having worked with PVC before I made it from PVC. The core is easier to make than it looks. It is made from 1-1/2 inch PVC pipe, 2 1 inch PVC slip on pipe caps, and 2 O rings. To make this core, the PVC pipe was heated and shoved onto a pipe cap. The cap was removed and a 1/4 inch was cut off the end. The ring was glued on the pipe cap, followed by an o ring and the pipe again. Making the o ring groove was that easy. The process was repeated for the other end of the piston. A hole was drilled for the rope. Added a couple flattened pieces of PVC for washers and the foam core from a foam football was used for a bumper. To finish the end cap was drilled for the trigger lanyard and the golf ball added to finish it off. On the steel upgrade in the back, I stuck to a golf ball trigger. Knowing ABS tends to split out the side when it fails, I stood behind it and filled it to 85 PSI. It held. After several fantastic shots I took it with me to a church camp where they have apple trees. Using fallen apples it is used every year at up to 65 PSI after the annual 85-90 PSI test. This is my oldest functional air cannon that has outlived several PVC cannons that cracked, developed leaky joints, or plain failed. This cannon has a typical range of 525 feet with fallen apples and has split a 2X6 8 feet long. Due to the bulk of the chamber, this cannon is a very poor single person hand held, but it makes great mortar shots. Load it, stand it on end, step on the rope between the cannon and golf ball, grab the blue trim and lift. Never ever load one of these while under pressure. Loading does the same thing to the core that pulling the rope does. Note the end didn't get pushed in all the way. It didn't leak or fail. Core detail All PVC and o rings. It leaks a little due to the saw cuts. Needed the ends polished before assembly. Live and learn. Here is a board hit with an apple from the ABS cannon. Last edited by Technician1002 on Thu May 26, 2011 11:13 pm, edited 14 times in total. So you have been using this for seven years? Oh man this cannon surely did its job! Very wise of you to pressure test it every year. With liability issues at the camp, this is a given. It has proven safer than PVC so far at low pressure. Even with abuse of being stepped on, and dropped, it has not cracked or shattered. When pressure testing I stand behind it off to the side to stay out of the way of a split chamber or failed piston valve. The bumper and cap is removed in pressure testing to leak check. With the requirement to step on the rope and hold the blue ring to fire, the barrel is way over head so there are no close range shots as the breech remains close to the ground. With the foot on the rope and holding the blue ring, the barrel is overhead. Just lift to fire. The core leaks a little due to the saw cut o ring grooves, so the 85 PSI test pressure bled to just over 80 by the time I grabbed the camera. I gotta make a new valve core for this. Close up of the gauge. So, the big question is, since "It was built to test the failure of ABS DWV non pressure rated pipe"... when are you going to blow it up? PinHead wrote: So, the big question is, since "It was built to test the failure of ABS DWV non pressure rated pipe"... when are you going to blow it up? Good question. My test pump only goes to 100. The cannon has been there a couple times. I was expecting a safer lower pressure failure. Over 100 PSI is scary for this size chamber. This cannon that was built to fail, has failed to fail. I'll blow it up when it fails it's annual pressure test. In the meantime, it's a great apple launcher. I'm collecting abuse, durability data. It's been dropped a few times, once on the valve. The end of the stem is flattened a little, but still works. It has taken abuse that kills my PVC cannons. 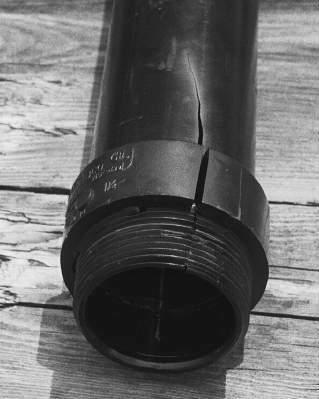 I found a photo of an ABS barrel that split. It did not shatter. This pic is from an Oxygen Propane cannon. PVC would have shattered. Another abused ABS cannon is this one. It is a spray and pray with pure Oxygen added to the mix. This could produce lethal shrapnel in a PVC cannon. Last edited by Technician1002 on Thu Jul 01, 2010 9:17 pm, edited 2 times in total. Since I expected it to blow up at under 100 PSI, I wasn't expecting it either. It's nice it lived. My first QDV still works. Edit, added 2010 pressure test. Yes it still works. Damage from a 2 inch piece of 1 inch EMT electrical conduit. It's dusty up in this thread! When's the last time you fired the ABS cannon?? Last year.. The campout is next weekend. Been using the newer ones instead. A few issues with my car have taken some of my time. Replaced a Hybrid battery pack in a 2002 Prius, then had a semi truck change lanes into me on the freeway. Located another Prius to put the new battery into. Just finished changing it and am in the process of registration. Still need to install my compressor inverter in the new car. Photos later. Oh that's just fantastic. Sounds like lots of fun. Well, at least you're alright. Technician1002 wrote: A few issues with my car have taken some of my time. Replaced a Hybrid battery pack in a 2002 Prius, then had a semi truck change lanes into me on the freeway. Obviously not driven by an environmentalist... glad you came out of it unscathed. The short story on the car is changed the battery on the 12th of July. $2300 part.. I was in the middle lane overtaking a semi. He swerved into my lane without signalling. I avoided him initially but I was being overtaken by a 1991 Toyota Pickup. Broke my driver door mirror and dented my fender and door, but his bumper caught my rear wheel well and spun me clockwise.. Lovely going down the freeway sideways.... Remember the semi changing lanes.. I was about turned 120 degrees so facing part way back down the freeway and caught the back of the trailer with my drivers side hood, headlight, fender.. tore it up back to the fusebox... This spun me back around straight with the freeway, so both bumps were turns, not hard crashes.. Bumpy ride, no windows broken or airbags deployed. Regained control and pulled off the road. No bruises or sore muscles. Due to the high mileage and age of the car, repairs exceeded pre loss condition value.. It was a write off. The car was a 2002 with just over 170,000 miles. It has been very low maintenance, still running on the original brakes, and all original light bulbs. First major repair was the battery replacement..
Insurance salvage value was only ~$900. I bought the salvage to keep my rims and hybrid battery to put in another car and sold the remainder for $800.. bought a 2003 of the same model with 130,000 miles and swapped out the battery packs. Using the rims to mount my snow tires. After I install the inverter, it will be my air cannon field power again. The most funny irony is I bought the new battery pack to last the life of the car.. It did.. All two weeks of it. Glad you got out of that one unscathed. Surprising especially since you were in a Prius. Many inverters have relatively high surge capacity, some do not. Some do 100% of rating only. and Some do about 200% for up to a minute. Read the literature. None will do high surge if the battery cables are not heavy enough. I used Welding cables and limited the length. A supercap would help too. Another option is to use a lower capacity compressor such as a nailer compressor at only 1/3 to 1/5th hp. They will run where 2 HP and larger won't start. My Inverter car has been damaged. Bummer. The upside. Replaced it with a newer model. Seems a semi truck wanted my spot on the freeway. Photo of the damage. Mirror was broken by hitting the pickup next to me, relatively minor damage. The semi crossed my hood and fender. You can see the path through the hood, engine compartment, and out over the fender. Last edited by Technician1002 on Tue Jun 17, 2014 9:31 pm, edited 3 times in total.